AFL Auskick is wh ere champio ns begin. It is where boys and gir ls first pull on the b oots an d learn their drop punts from their torpedos . AFL Auskick is fun for the kids and stress-free for parents and is facilitated with the help of parents and volunteers and managed by the community, for the community. The NAB AFL Auskick Rookie program is where it all starts. 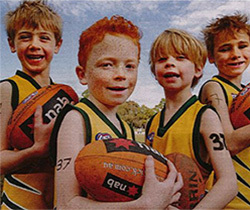 Children aged from five to eight learn the fundamental skills required to participate in Australian football. The kids are grouped depending on their age. Kids will learn new skills and play fun games. Children are grouped by size and ability for safety and participation. No Auskicker ever feels left out. There’s no tackling or rough play. Parents are encouraged to participate and enjoy a physical activity with their children. 2. small group, non-contact football games. Sessions range from 50 minutes (level 1) to 70 minutes (level 3). Levels are based on age and ability. Players rotate between forward, centre and back positions in all games. We conclude each session with the Club song. In Auskick there is no tackling and no scrimmage. In Auskick our EMPHASIS is on fun, safety, fair play and inclusion. Games are relaxed and non-competitive. Everyone is encouraged and get a fair go. Kids play in three levels for safety and to encourage participation. Auskick is about learning physical and social skills. The emphasis is on fun in a structured environment. The format is simple: fun warm ups; teaching skills by showing and practice followed by a non-competitive game of footy. In games, players are matched on size and ability for safety and to encourage participation. Players are positioned in three zones to reduce congestion, but rotate positions in breaks. The AFL rules are modified for maximum participation and opportunity for personal achievement. Auskick does not permit tackling, smoothering, stealing the ball, diving on the ball or kicking off the ground. Further, to encourage skills, once a player gains possession all other players back off to allow the player to kick or handball unchallenged. The language of marks and possessions is AFL but the basic skills of kicking, catching and evasion are intrinsically useful and transferable to any sport. For games, players are grouped according to age and experience for safety and to encourage participation. Auskick depends on parental participation on the field and off the field. The program is well supported by the AFL and the volunteer coaches receive great training and support. Auskick families enjoy a friendly (non-competitive) atmosphere. Looking for numbers or being a reserve doesn’t happen in Auskick. Every player is included. Auskick is all about having fun, getting to know the other folks and participating the development of your child/children and community. Registration includes an Auskick backpack loaded with interesting stuff including an Auskick ball, cap and drink bottle, team photos, participation trophy and insurance. Talk about it at your school or preschool. Bring your friends along. Our first gathering will be in late March. All registered players will be contacted with details.